On December 14th, 2012, a lone gunman opened fire at Sandy Hook Elementary school in Newtown, Connecticut, killing twenty-six people. Because of the profile of the victims (twenty of those killed were children), the tragedy sparked an especially large outpouring of grief from around the world. As in the case of Virginia Tech, the result was an incredible amount of temporary memorial and condolence material that would demand a great deal of attention of effort to process. 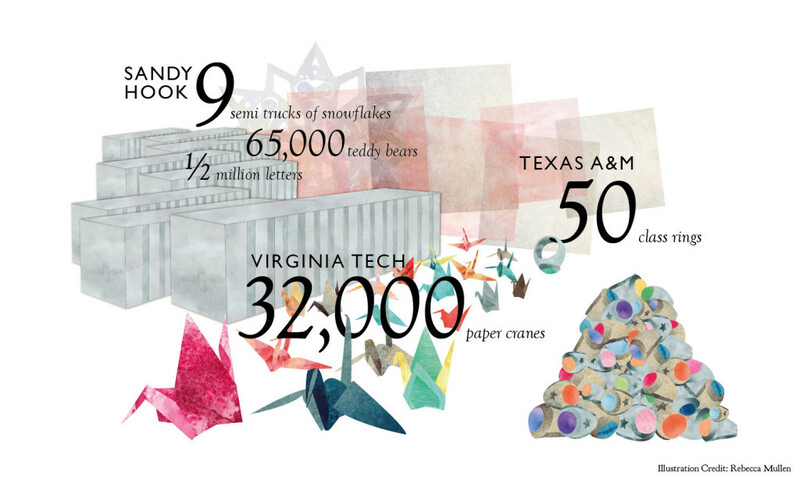 However, unlike the cases at both Texas A&M and Virginia Tech, where the tragedies were connected to larger institutions which assumed responsibility for handling the materials, it was unclear who would lead the efforts to manage and preserve the condolence materials in the wake of the Sandy Hook shooting. Several individuals stepped up to the task in overlapping ways.